This week I wasn’t sure I was going to get a tile done but I was able to without much wrist pain. However, shading was where I was a bit challenged. I guess I press my pencil differently when I shade than I press my pen when I draw. 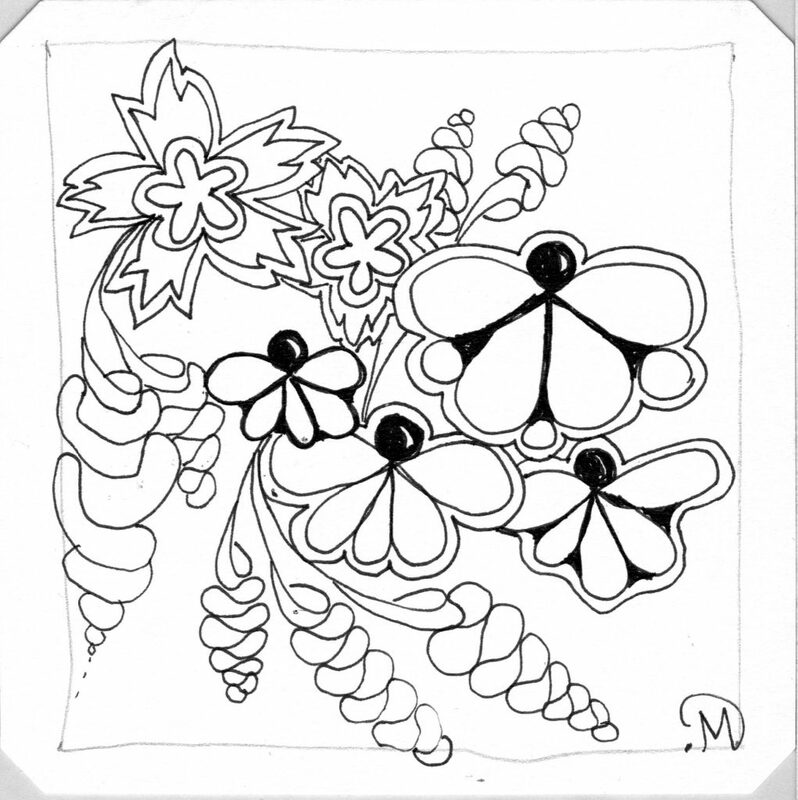 At any rate, I used the Square One: Purely Zentangle focus tangle of Fan Club but did not do it justice. I will have to play with it a bit more because I do like the tangle quite a lot but I just did not do it justice here today. I cannot seem to get the right sizing on the “petals” and I cannot squeeze as many on each fan as the step-out. I think I like it best with the outer aura and extra orbs. Then I used Calantha which was the focus tangle on Pattern-Collections yesterday. I didn’t do this one justice either. It seems that I was not in a pointy/jagged mood of drawing. 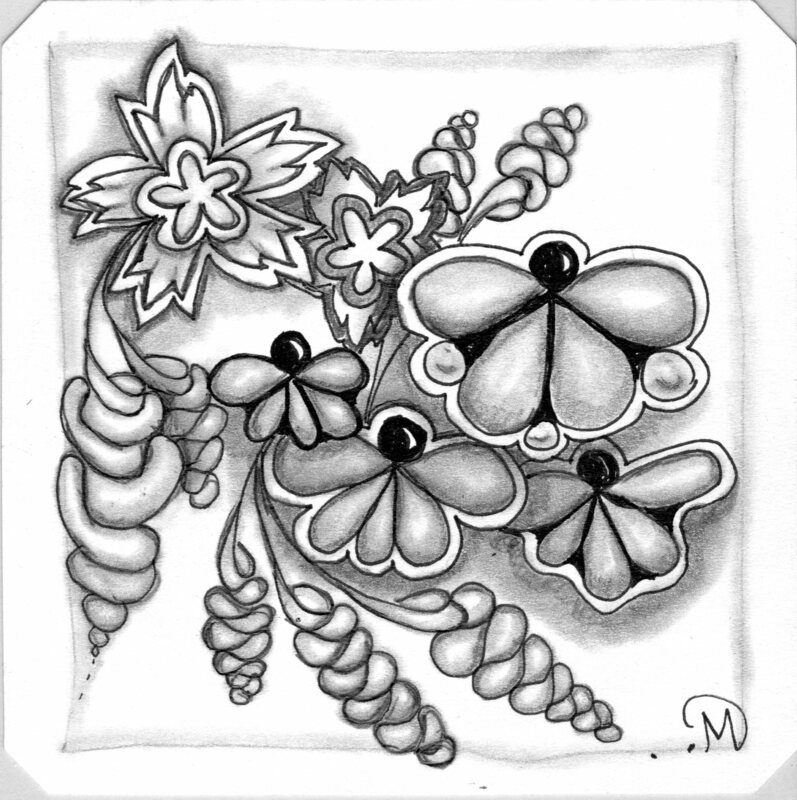 Now that I think about it I should have adjusted it and added some rounded “petals” instead of the pointed ones. Hmmm, well, maybe I will go back and play with this one again. 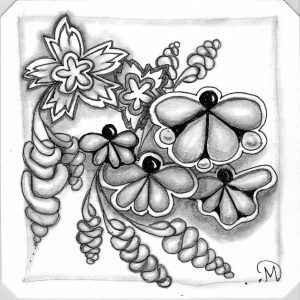 The final tangle I included was today’s focus tangle, Cupcake Flower, on Pattern-Collections. At first I thought it resembled Zinger quite a bit and wasn’t sure I would like this one very much but since Chris had written such a good piece when introducing Fan Club as the Square One: Purely Zentangle focus tangle for the week, I decided to give it a go anyway. I have to tell you, I LOVED IT! It is so easy to get into a flow with this one. You simply must give it a try. If I’d have had more room on my tile, I probably would have drawn a few more. It really is good. Here is my tile before shading. That big cupcake flower on the left was my first attempt and I wasn’t getting it, so I kind of finished it off like Zinger. But with the next one, I caught the flow of the tangle. And here it is after being shaded. I’m calling it Butterflies because the Fan Club resembles butterflies to me, the way I’ve drawn them (with not enough ‘petals’ . Here it is a bit smaller, showing less imperfections. Unfortunately, it was late by the time I got this finished and had no more sunlight to take a photo of it. Maybe I’ll get one soon and add it here. I appreciate you stopping by and comments; it means a lot that you take your time to do so.